Are you ready for a cheeky little game of ‘find the pot of gold at the end of the Rainbow’? Everyone loves an Irish-themed slot game, that’s why almost every games company seems to make one which you can find here at this link – you can’t get better than the lucky tales of the Irish for a betting game. It’s like a match made in gambling heaven. Barcrest Software is a long-established games developer, that’s been around since the heyday of 1968. At one point they were the name in British pubs and casinos all over the country, but now have to share the playing field with other names. They always try to stay ahead of the curve with recent casino slots, which is the secret to their longevity: as well as being bought out by IGT in 1998 and then again in 2011 by Scientific Games. 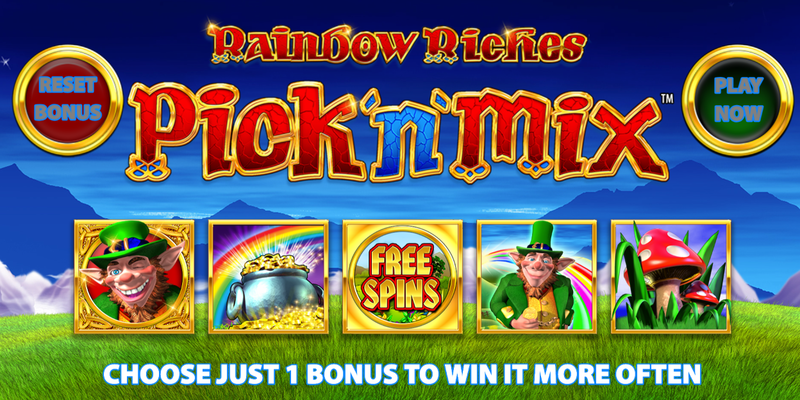 This Rainbow Riches Pick n Mix follows on from their standard, and popular, Rainbow Riches slot game – but with an extra ‘pick’ bonus feature. Road to Riches – an enjoyable little feature that takes you to a literal road of riches. To trigger the round you need to land three or more close-up Leprechaun symbols – three will get you to a normal road that you can move up after spinning a bonus wheel, but if you land four you’ll go on the richer road – potentially helping you scoop up to 500x your stake. 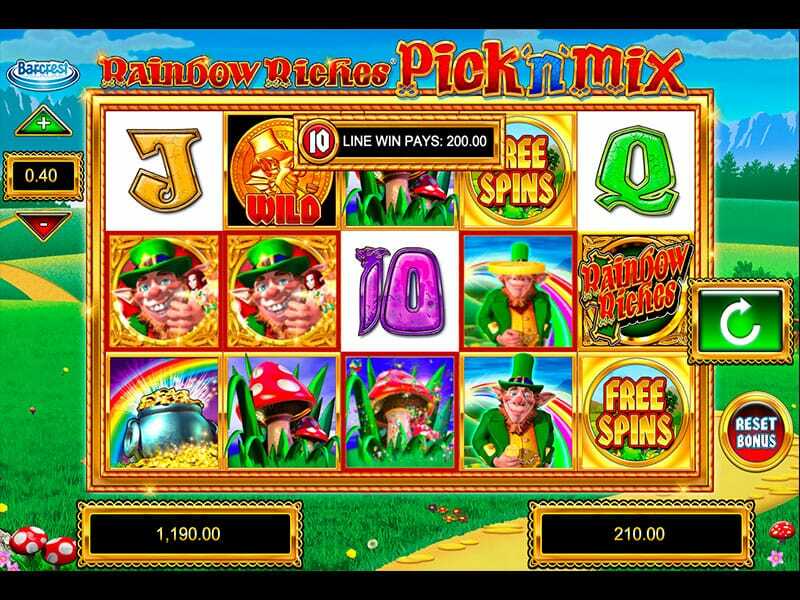 Pots of Gold – this is triggered when three or more pots of gold land on the reels. If you land three pots then bronze, silver and gold pots will fly around the screen until one is randomly selected to reveal your prize, four pots will give you bigger rewards as only silver and gold pots will come into play, or five symbols will see you automatically rewarded with 500x your stake. Free spins – if you land free spins symbols on reels 1, 3 and 5 then the Leprechaun will reward you with either 10, 20 or 30 free spins. The free spins symbol also acts as a wild & can retrigger the feature. Cash crop – this is a round that awards you with multipliers if you land three or more Leprechaun rainbow symbols. You’ll then be taken to a grid of coins where you can pick and collect potential multipliers. Magic Toadstools – landing three or four toadstools will send you to a picking round where you can reveal cash prizes or a magical fairy which grants you more picks. You’ll also have multipliers added to your second to last and final pick. 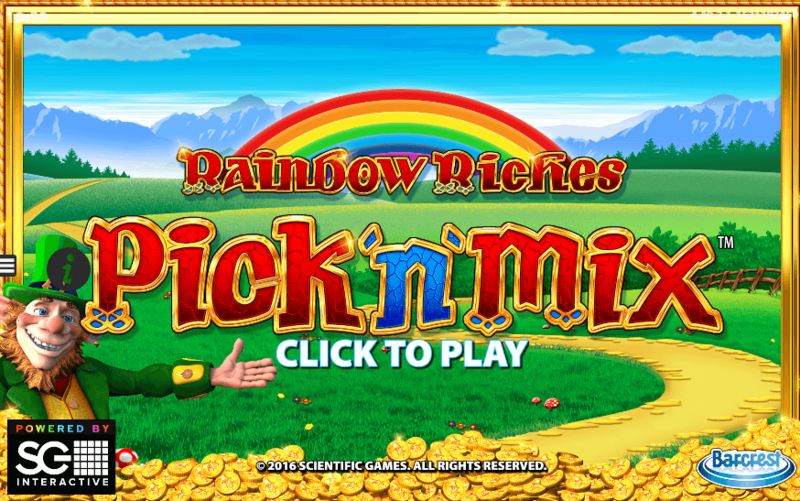 This Rainbow Riches Pick n Mix is a great follow on to Barcrest’s standard Rainbow Riches slot game. Interesting and full of different features, this game really takes the standard slot game outside the box and offers something different for players. Plus play the original, Rainbow Riches.